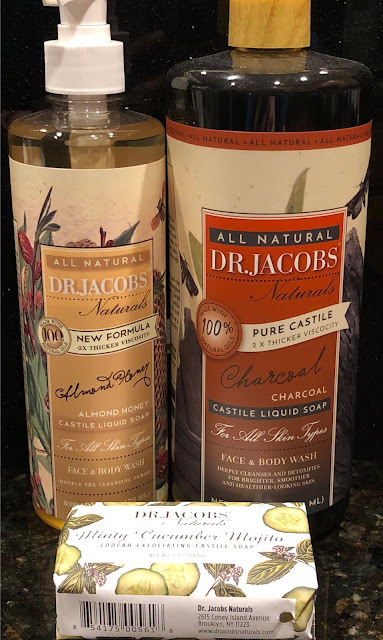 I am really interested in using natural beauty products and was given the opportunity to try out Dr. Jacobs Naturals products and am absolutely thrilled that I got the chance to. I have extremely dry skin on my body so it's tough to find products that don't irritate it. I was sent two liquid Castile hand soaps - one in Charcoal and one in Almond Honey, as well as a Loofah Exfoliating Castile soap in Minty Cucumber Mojito. What I like about these products is that you can use them as a facial and body wash as well as hand soap. They are that gentle on your skin. I use the Charcoal soap in the shower as it deeply cleans and purifies my skin. I am a firm believer in the power of charcoal for detoxifying your skin. I find that every time I use it, my skin looks brighter and feels soft and silky. There is no harsh scent at all. I use the Almond Honey as a hand soap. I am forever washing my hands and they are always dry and scaly because of that. There is a wonderful, light scent from this soap. My hands are always soft and moisturized no matter how many times I wash them. As for the Loofah Exfoliating soap, I use that on my face. I have very oily skin and I find that washing with this product not only deep cleans my skin, but leaves it soft and moisturized. The Minty Cucumber Mojito scent is especially great in the morning as the scent wakes me up and gets me revitalized. I highly recommend that you visit Dr. Jacobs Naturals to purchase these scents and so many other fabulous products. *I received these Dr. Jacobs Naturals products free to test and review. All opinions are 100% my own.